Being a bookaholic I am always on the search for new and interesting books that will help inspire me and so when I heard that the creator of TOMS one of my favourite all time organisations had written a book about starting something that matters I knew I had to read it. And boy am I glad that I did! This book has to be one of the best and most inspiring books I have ever read. Whenever anybody asks what is important to me and what I would like to do with my life I often to say I would like to make a difference even if its just to one person it would be worth it and that is why I am studying a degree in Social Work. But there is part of me that wants to try doing something a little bit different and although I have lots of idea's I often have no idea where to start. Enter Blake Mycoskie! This book is so fantastic for helping to inspire you to make a difference and to do something that will help others. 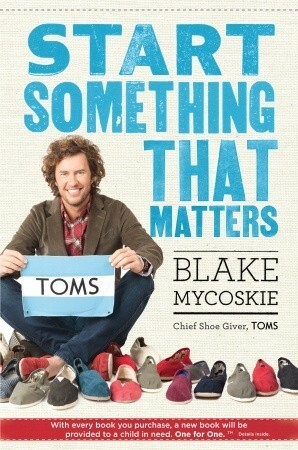 Step by step Mycoskie goes through the stages of how he believes is the best way to start something that matters using examples from his own company TOMS and from other companies that have also tried to make a difference. If you are looking for an interesting and vibrant read full of tips and inspiration than I would really suggest you get a copy of this book. It was so amazing that I managed to read it in just two days and now have lists and lists of things I'd like to try to make a bit of a difference.